The call for the 2019 Artist in Residence Programme is now closed. Art and scientific research have several things in common. Artists and researchers investigate the nature of our presence in the world, push boundaries in knowledge and technology, and venture into the unexplored. The questions our researchers study naturally provide inspiration for artistic inquiry, which in turn can offer a fresh perspective of the scientific endeavour. Both disciplines require creativity, curiosity, and imagination, combined with scrutiny, technique and determination. IRB Barcelona's Artist in Residency Programme aims to connect artists with an interest in interdisciplinary science with the wide range of research, scientists, data and infrastructure available at the Institute. It provides a unique opportunity for artists to immerse themselves in the IRB Barcelona community for a free exchange of ideas and to explore, learn, and form relationships with our scientists and stakeholders. The programme seeks to provide time and space for reflection and inspiration for artists and scientists alike. Direct access to its scientists to learn about their research and methodologies, and how their work relates to society. Direct access to core facility staff for demonstrations and explanations of the technologies used to gather, interpret and visualize data. Access to images created in the laboratory, when possible. Facilitated contact with its network of collaborating institutes. Access to all scientific lectures, conferences and workshops. Possibility to apply for external funding for specific activities based on the collaboration. Full IRB Barcelona member status for the duration of the residency. Visibility for the artist and his/her work through its communication channels (print and online publications, digital platforms and social media). Participate and provide input into the organisation of seminars, round tables or workshops on topics such as the role of art in science, visualizing science, creativity, etc. Participate in public engagement activities such as the Open House day, Science and Art events, etc. Promote the visibility of IRB Barcelona and the programme through professional networks, websites and social media channels. Promote the art work produced in the framework of the residency through art shows or exhibitions open to the public. The residency will last for an agreed period of up to one year. IRB Barcelona is unable to provide funding for the artist. Selected candidates requiring financial support are encouraged to seek external grants to cover stipends and expenses for the duration of the residency. I believe science and art are very similar in that they both involve an endless cycle of attempts and failures, yet scientists and artists passionately continue to seek answers about life. They both approach problems with a similar open-mindedness, fearfulness and in an intuitive way. New scientific concepts have the capacity to enlarge the imagination and the artistic vocabulary of an artist. Many artists today have a close relationship with technology and science. Collaboration between art and science has the potential to move society forward. Artists serve as great partners in the communication of scientific research, thereby making discoveries more compelling and more approachable. My art practice integrates the traditional art-making techniques with new media technologies. By synthesizing the real and the imaginary, I am heightening awareness of the unimaginable beauty and diversity of our world. 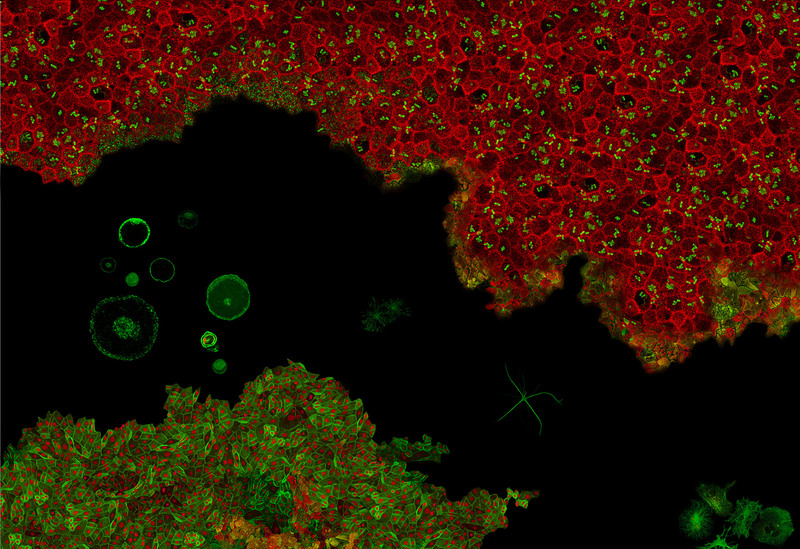 I see scientific imaging as an observation of my surroundings. I take a sample, observe its behavior, form and colors and transfer these characteristic features into other mediums, giving life to other platforms. 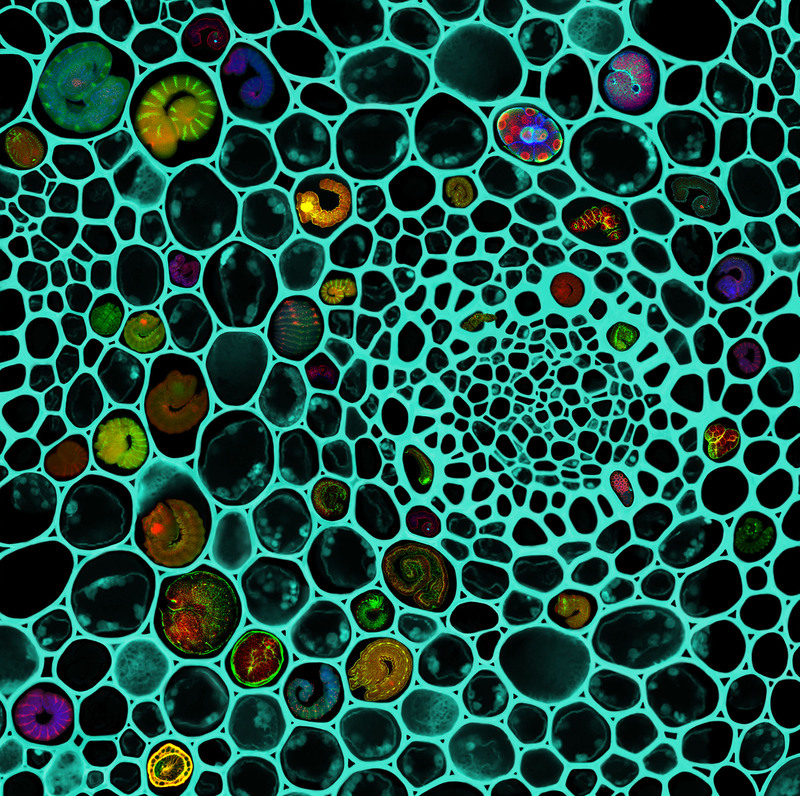 I use various techniques, such as painting on glass, printing on silk, glass blowing, and digital collaging, to invite the audience to experience the microscope slides of the cell structures on a large scale. Even though these “imaginary landscapes” seem to be highly graphical, they are in fact very real natural formations. My art has always been inspired by nature and life itself, but looking at life forms at different magnifications has helped me to develop distinct insights into life. My fascination lies in the interrelation between the micro and macro worlds, in particular where their components overlap and unify until they finally come together as one. Artist Ayşe Gül Süter's residency is supported by the Turkish Cultural Foundation. Anna Rierola is a Barcelona-based digital artist whose interests lie in science and investigation. She uses scientific images obtained during research projects to compose pictures and murals. She had the oppotunity to spend a year at the Institute and was the first IRB Barcelona Artist in Residence. My work is a response to what I experience when diving into the world of scientifically-made images. These visions awake my innate concerns about how and why the universe works and the final sense of it. This kind of perception challenges, inspiring an aesthetic response that lights up new mental paths. The close and generous collaboration with Research Institutes and scientists has provided me with a fertile field for creativity and knowledge, and the possibility to select and collect images captured by different types of devices: Tomography, X-Ray, Confocal Microscope, SEM, TEM, MRI, Telescopes, and Satellites, that all serve as a starting point for my works. It is within this very context that I begin my personal process of deconstructing atoms, nanoparticles, cellular nuclei, stem cells, neurons, and far-away star constellations. Thus, an internal syntactic and semantic process of reconstruction and reorganization of those traces begins, which results in a new image that gives a different global perception. The access to new visibilities ranging from the infinite (beyond the observable universe) to the infinitesimal (closer than the tiniest particles), pushes me to think about the existence and sense of a global order, where all the parts embrace and unify until they merge, one into the other. I would like my work to be an expression of that bonding, of the tiny connecting to the whole, and therefore able to illustrate that the most elemental particle and the vast immensity are closely related. There is intertextuality between the initial scientific images and their final aesthetic representation, in which the original traits disappear only to reappear later on in a new sense, either evoking new landscapes, worlds and galaxies, or bringing unknown structures to the surface: thus revealing that the real texture of reality is infinitely more complex than our minds can comprehend, and that we are ruled by laws with a fascinating internal logic. 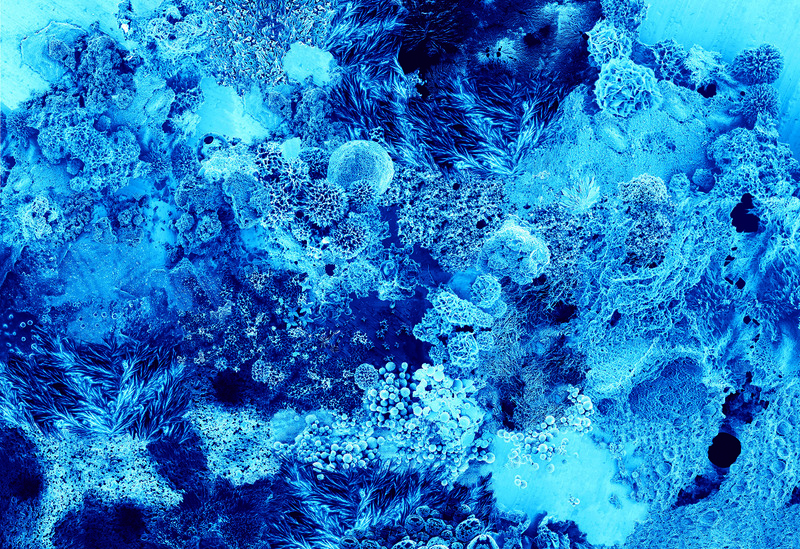 “Scientific discoveries have always had a profound impact on art,” says artist Anna Rierola. If you are interested in learning more, please contact us at info@irbbarcelona.org.